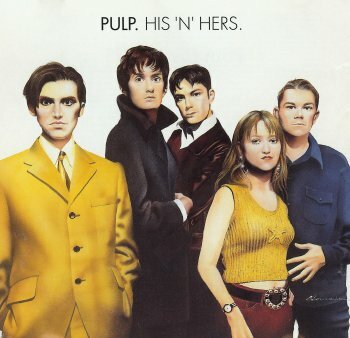 Pulp's eagerly awaited Sheffield concert is only hours away. Contrary to earlier reports, the Boxettes will not be opening, instead 'home movies' will be shown at 7:30. One of these reportedly dates from 1979. At 8:15 there will be a 'countdown to Pulp' with Pulp taking the stage at around 8:30. EDIT: see this page for more details. The deluxe edition of His 'n' Hers has been released on vinyl this week. It has come out on the Music on Vinyl label and was released on Monday (3rd December). 8-Page booklet with liner notes from Jarvis Cocker - presumably the same notes as for the deluxe CD version. The setlist and more details can be found here. Pulp, with full band in attendance (minus Russell whose "bad back" Jarvis gave as reason for absence), picked-up their second music magazine gong of the year at the Q awards on Monday October 22nd, following their "Outstanding Contribution To Music" award by NME in February. This time, the award was for "Inspiration". Recorded in 1991 at the tipping point of their fame throughout the 1990’s, Pulp perform a glorious set at London’s Town & Country Club in Kentish Town. As one of their first ever live performances on UK television, the band performed on a billtitled ‘Class of ‘91’. Along with other emerging talent, in association with the NME, Central Television took the brave decision to record theband at the very point at which they were about to explode onto the mainstream music scene.The NME wrote “Pulp are the party clowns and wisely flaunt the metaphysical red noses with deadpannedglee. Singer Jarvis is to all intents and purposes Frank Spencer auditioning for Saturday Night Fever, andtherein lies the essence of Pulp - sartorial catastrophes dressed in funk-splattered overcoats. When they'renot getting groovy, the fivesome are manufacturing an absurd brand of pop which is more sly than a foxwith a crossbow. Furniture meets Chic and decides hey, maybe we can live together after all”.This amazing gig is an insight to the eclectic roots of the band’s musical style. The beginning of this recording even has aflavour of the eccentricity of lead singer Jarvis Cocker, arriving as he did just five minutes before going on stage, havingbeen stuck on a train returning from a stage night in Liverpool. His Rolf Harris-style Stylophone solo needs to be heard to be believed. NB: the above press release was clearly cobbled together from this PulpWiki page. Jarvis Cocker is to take part in a BBC Radio 5 Live show presented by Richard Bacon. It will be recorded live in front of an audience at the Crucible Theatre, Sheffield. Jarvis will discuss his home town and influences on his career. The show is taking place on Thursday 11 October from 2pm to 4pm. Tickets are free and are currently available via the 5 Live website and at the box office at the theatre. 5 Live's Octoberfest 2012 is a free three-day festival taking place in Sheffield from 11 to 13 October. This will feature "an exciting mix of live broadcasts and events across the city". Richard hosts his 5 live show live from Sheffield. Expect surprise special guests including Pulp frontman, Jarvis Cocker, who will talk about his life in music and some of the programme’s popular features including the Moan-In. There are also rumours of a date in São Paulo, Brazil. Jarvis returns to the BBC 6 Music airwaves on September 2nd to resume his two hour Sunday Service show. No official confirmation yet, but it is rumoured that Pulp will play concerts in Chile, Argentina and Brazil during November. Pulp are to play concerts as part of two music cruises in the Caribbean. 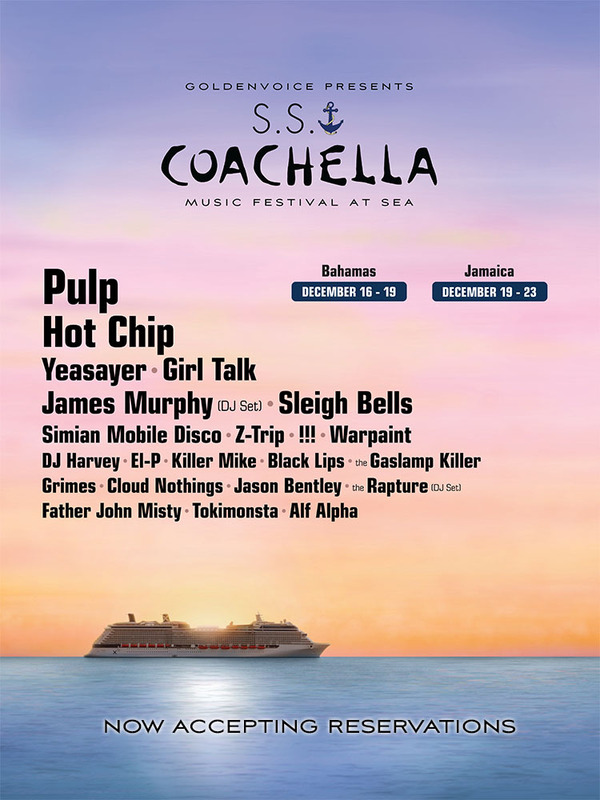 'SS Coachella' is billed as a 'music festival at sea' and is being staged by the organisers of the Coachella Valley Music and Arts Festival. The voyages on the Celebrity Silhouette cruise ship will be round trips from Fort Lauderdale, Florida. The first between 16-19 December will visit the Bahamas (Nassau) and the second between 19-23 December stops at Jamaica (Ocho Rios). Pulp will play either one or two concerts during each cruise. Other bands on the bill include Hot Chip, Yeasayer and Girl Talk. Prices start from around US$900 (£580), including service charges and taxes. Tickets went on sale on Saturday, 21st July. Further details can be found on the official website: http://ss.coachella.com.